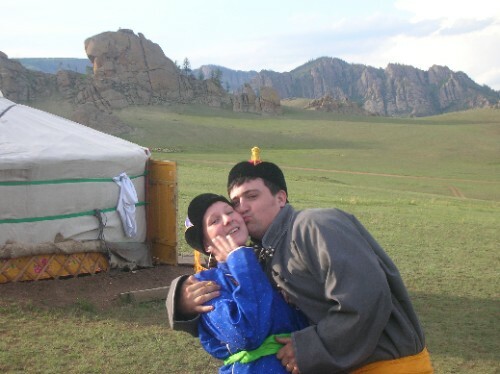 We had two days in a traditional Mongolian Ger (Yurt) camp when it was originally suppose to be one night - so I think we were all a bit apprehensive about spending so long in the middle of nowhere! A Ger is the traditional nomad home and they are found all over the Mongolian countryside, normally there are 3 or 4 Gers and the nomads move around in family units as opposed to tribes. Our trip to the Ger was 1 hour out of Ulaanbaatar and the roads were just dirt tracks so quite a bumpy ride. On the way to the camp we saw loads of herds of horses, cattle, sheep, yaks and even a couple of camels. Our camp was a tourist camp so set up for groups like us. There are about 20 Gers, shower facilities and a restaurant. We had 3 Gers which we outside of the main camp as we had no electricity (in the cheap seats) but it was probably a better experience as we did feel isolated. Our first day consisted of a hike over the hills to see Turtle rock a natural rock formation in the shape of a turtle, however there were lots of Tourists camps around here and it seemed quite busy. In the evening we went horse riding in the fields the horses were really work horses and are used to riders. To make the horse go faster you have to say choo. Wayne kept wanting to go faster so kept shouting choo - his sped up then so did mine as we were out in front! One of the others was on a horse that kept going the wrong way and had to be reigned in. We were on the horses for about an hour and we both loved it - it certainly not anything we would have done at home. The next day we went to a monastery which was only built in 2004 - initially we thought it was for the tourists but apparently there are only a few monasterys in Mongolia and this was a specific meditation monastery the monks woud then come from the city here to meditate. The monastery was set on a hill so a bit of a climb but worth it the views were good and the monastery itself was beautiful it had prayer wheels all around the outside so Wayne went off and spun each one! On the way back down the hill we stopped at a natural spring for a drink and cool down. The next stop was to see a nomad family in their ger. The family live quite close to the tourist camps but they do live a typical nomad life. We went in to the ger and were give natural yogurt which was a bit bitter but with a touch of sugar not too bad, although Wayne liked it plan. We were then given some curd (like butter) and hard cheese which was awful! We then had a look outside at their cattle herd - We all asked lots of questions through our honcho and it was a really interesting experience. It seems strange to think that people still live this primitive existence I think 2 days was enough for us. We then walked across the field to a traditional Mongolian festival where we saw a throat singer, a shaimen dancer, a contortionist - a little deaf girl of 9, she was excellent but it was a little strange. Then came the Mongolian wrestlers, arechers and horseriders. People from the audience went up to wrestle it looks quite fierce being thrown around in the dirt. Ben also went and had a go at the archery and nearly hit the guy collecting the arrows. The festival was pretty good, but we missed the annual nadam festival by 1 week this is a massive event which takes place in the city. Tsolomen our honcho also arranged for us dress up in traditional mongolian dress deel and a hat - the pictures are great (will get them on as soon as we can). In the evening he also arranged for us to play a traddional game of "sheeps ankle bones" a bit like snap but you have to flick the bones with your fingers if they touch you win the piece the person with the most bones wins. The next day we headed back to the city as we were cathching the train the next day (7/7/07) on the way back we stopped at a river which looked really deep but was infact shallow. Svein and Hakon went swiming but it was quite cold and the current was too strong for most of us.